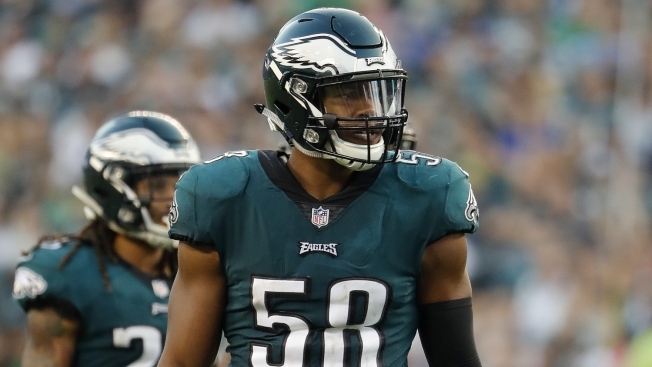 Former Eagles linebacker Jordan Hicks is reportedly heading to play for the Arizona Cardinals after four seasons in Philly. That's a nice deal for Hicks, 26, who has been a productive player in the NFL when healthy, but his availability has been a problem. Of his four NFL seasons, he's played just one complete year. He tore his Achilles in 2017 and missed more time with a calf injury in 2018. In 12 games in 2018, Hicks played and started 12 games, but once he returned from his calf injury, he was in a more limited role. He played every defensive snap before the injury, but Nigel Bradham took over that responsibility and never gave it up. These days the Eagles aren't in their base defense very often. Instead, they are normally in nickel, which means two linebackers on the field. For part of the 2018 season, that meant Bradham and Grugier-Hill. That is likely the answer for now unless they replenish in free agency or the draft. The only player left from Chip Kelly's 2015 draft class is first-round pick Nelson Agholor, whose future is at least up in the air.